In a stunning final day of boxing, we had an incredible array of talent on display. With some nail biting final rounds, sudden reversals and shock finishes, today was THE day on the 2013 boxing calendar. The host nation dominated the medal table with eight medals, which included four golds. They were closely followed by Cuba, who won two golds and took a total of five medals. Azerbaijan took third spot (two golds, three medals). Russia was the second European nation, while Italy and Ireland also had good tournaments. Algeria was the top African nation with a silver earned by Mohamed Flissi. Let's take a look weight by weight at the highlights of the action. Flissi came out looking determined against the local boxer and landed some fast hooks early on. The good news for Flissi was that the crowd weren't quite at their usual decibel levels yet this early in the day. That said, with the packed stadium almost entirely supporting the local boxer, Flissi was very much on his own out there. Some heavy shots were exchanged in the first round with the Kazakh boxer counter punching well. Round two started in a similar way with the southpaw Kazakh looking the more accurate and Flissi appearing a little wild at times. The Algerian landed a hard right towards the end of round two though while Zhakypov scored consistently with his jabs. Zhakypov was beginning to open a lead. Flissi came out strongly and scored some heavy shots before the local boxer started shutting the match down. With his coaches screaming at him to keep busy, Zhakypov began to crank up the pressure again and sealed the deal. Thus the first World Champion in 2013 was to be Birzhan Zhakypov of Kazakhstan. This was the first major tournament win in the 29 year old's career and it genuinely brought tears to the eyes of many in the audience when the Kazakh flag was raised and the anthem sung, such is the love for both boxing and country in Kazakhstan. They feel that their boxing is something positive that is finally putting the country on the map. The southpaw Russian had a very intense look in his eyes and both boxers looked ready to explode into action at any moment during round one. There was a significant degree of tension and edginess in the performance of both athletes. As late as the end of round two, they still looked very tense and continually poised to attack, but at the same time they seemed hesitant to actually pull the trigger. When they did let the punches fly, they were both very effective and looked as sharp as butcher's knives. In the first minute of round three, the Russian manoeuvred his opponent into a corner and got off some hard shots. Late in the round, they engaged somewhat more franticly as they tried to make a last minute impression on the judges. Eventually though it was Aloian who took the bout by split decision to become World Champion. Both of these boxers have been impressive throughout this tournament with the Russian probably the hardest puncher in the world at his weight group at the moment, and the un-seeded Azeri having developed a reputation for causing major upsets. Nikitin took to the centre of the ring early, hoping to dominate the space. But the Azeri chipped away at him like a man trying to cut down a tree. The trouble was that this tree could hit back. Though the Russian spent much time behind his guard and when he did unleash a punch, the power in his hands was clear for all to see. Chalabiyev caught Nikitin off balance in the second, which saw him hit the deck. It was only a slip, but it was a reminder that this was not going to be all plain sailing for the Russian who found himself backed into a corner shortly after. It was becoming clear that Chalarbiyev's tactics were simply to attack continuously, keeping the Russian on the defensive. Though his strikes were not hugely powerful and not many of them landed cleanly, it was enough to keep the Russian occupied and made it hard for him to mount any kind of systematic offense from behind his guard. The game plan worked and it was the Azeri that took the bout 3:0 in clinical fashion. Both boxers looked very composed and relaxed before the bout and it showed in their looseness in the ring during the first round. As a result, this was possibly the best bout of the finals and it became open and enjoyable to watch. It should be remembered that Lazaro Estrada Alvarez took a gold medal in the Baku World Championships in 2011 at Bantamweight, so he had some experience in this kind of high pressure environment before. But the Brazilian was in no way out-classed and looked very good, scoring heavily and often. The Cuban of course was also able to put his own shots in, and with equal efficiency. The calmness displayed by both athletes as they worked so intensely was commendable and beautiful to watch; we were offered a real tactical treat in this all Latin American final. Both boxers look very complete but it was Estrada who went home happy tonight, having won successive World Championships at different weight categories. This was always going to be a tough one for the Cuban, who looked very calm even as the crowd chanted his opponent's name. Akshalov has arguably been one of the boxers of the tournament. He was quickly pursuing Lopez across the ring and landing hard shots within moments of the opening bell. The Cuban's ability to hit and move seemed to be curtailed by the Kazakh, whose footwork was excellent and he skilfully cut off the ring. The Cuban landed some good one two combinations at the beginning of the second round, but the Kazakh boxer was totally dominant again thereafter. This was one of the most one sided bouts thus far in the finals. Lopez is a highly talented boxer though and remained dangerous, but he just wasn't able to match the intensity of the Kazakh. The Cuban began to look better in the second half of the third as the local man took his foot off the gas slightly, giving Lopez some space to work. Akshalov slammed that door shut fairly quickly however and finished on a flourish to take the bout. An excellent tournament for Akshalov, the new Light Welterweight World Champion. In a second Cuba verses Kazakhstan final, the national team captain Yeleussinov squared off against one of the most aggressive Cubans at this year's World's. Despaigne doesn't dance away; he brings the fight to you. Thus it was the Kazakh who was on his bike early on, trying to score from the outside. This was a tight bout and an interesting clash of styles. Despaigne discovered early in the second that the Kazakh boxer could hit hard and that made him slightly more cautious about coming forward, forcing him to pick his slots more carefully. Round two was even better for the Kazakh boxer as the Cuban really needed to start chasing now, but he seemed unable to move up another gear. 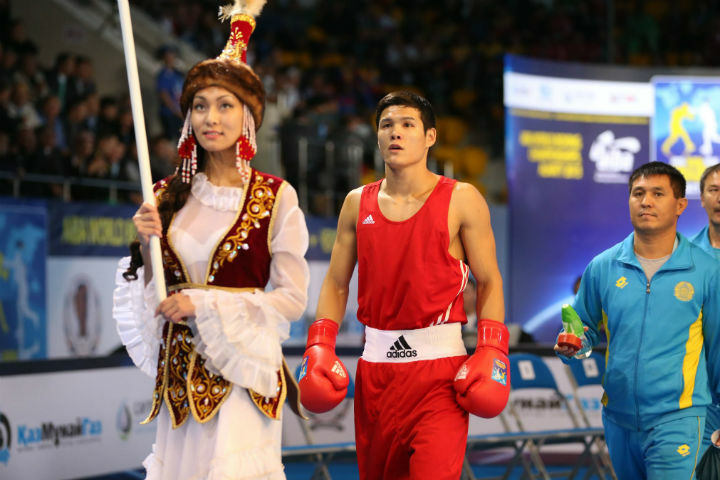 There were more punches thrown in round three by both boxers as they traded leather in the centre of the ring, but the Cuban was not doing enough to make a dent in the Kazakh's well managed lead. Yeleussinova looked really impressive across all three rounds and took the bout 3:0 for Kazakhstan's third gold medal of the tournament. Barely had the journalists jotted the fighters' names down when the Kazakh man knocked Quigley to the floor at just 1:36 into the first round with a hook. The southpaw Alimkhanuly was basically dominant thereafter. He was able to land hooks on the move and stay out of range of Quigley's attacks. Round two was more of a battle with both fighters throwing numerous heavy shots in combinations with each other. It became a real scrap. With a minute left in the round however, Quigley had either gassed out or been hurt by something as he began covering up more and had to take more punishment as a result. He recovered somewhat at the very end and began to mix it up again. By round three however, the Celtic boxer looked absolutely exhausted and was clearly running on an empty tank. The hard hitting Alimkhanuly just kept pouring on the pressure to secure an indisputable and classy victory. The third Cuba verses Kazakhstan final was another thriller. The Cuban opened the bout by dancing with his hands down while the Kazakh tried to shut the ring down. Round two was more of a cat and mouse game with both boxers looking to make use of the sniper option and hit and run. If the Cuban had looked impossible to hit in previous rounds, he certainly clipped in this one. At the end of the second, he was punished for leaning back when he was caught off balance. He would have fallen were if not for his grip on the ropes, which held him at a peculiar 45 degree angle for a second. Overall however, he seemed to have the slight edge. Thus the bout was very close going into round three, and the score boards showed a tie between two judges and the third marginally favouring the Cuban. Peraza's boxing was good enough to keep the crowd fairly quiet too which was perhaps indicative of what was to follow. There was enormous disappointment in the arena when the Cuban's hand was held aloft and it was personally difficult to take for Niyazymbetov, who seems to be the eternal silver medallist. Having taken silver at the Baku World Championships in 2011 and the London Olympic Games, he must be wondering if his moment will ever come. The sold-out audience in the arena reserved an especially sympathetic and heartfelt round of applause for him as he left the field of play with his head hung low. This was a bout that has been fought before. The two met just before the London Olympics at a small event when Russo lost to the larger Russian. Before the bout, he described his opponent to using very gracious terms, saying specifically "that his guard was very difficult to break through" and that he is "highly technical". In Round one, both boxers did indeed take a technical approach with Clemente landing some body shots and hooks, whilst trying to stay out of the way of the taller man's jabs. At the opening of round two, Russo landed a big looping hook to the head. While his opponent did indeed have a solid guard just as Russo had described, the Italian himself by contrast boxed with his hands around his waist. This was possibly as he was hoping to open the defences of his opponent by using his own head as bait. Brave and dangerous maybe, but very Italian. In the last 30 seconds of the round, the Russian began to find his range a little, which meant that the final round could be dangerous for the smaller Russo. Round three was indeed a much tighter affair, with the Russian's size and physicality becoming a factor. In the last minute of the round the Italian was on his toes again, but this time the Russian was scoring. Russo wasn't ever concerned however, and he proved to be right, taking the bout 3:0. The two big men have been outstanding over the last few weeks with Dychko's mobility surprising many, and Medzhidov's punching scaring many others. The tall Kazakh boxer made good use of his reach, particularly his jab, while the smaller Azeri boxer looked to close and land overhand rights. As we reported yesterday Dychko's footwork is really more reminiscent of a Light Heavyweight boxer's than you would expect from a man of his size. He was clearly and comfortably winning the bout in everyones view through the first and second. With a few seconds left on the clock in the second round however though the Azeri finally landed a huge right hand. Ominously, it looked like he was beginning to find his range. Just forty seconds into the third, that hunch was proved justified. Medzhidov threw a cannon ball of a left and a missile of a right which dropped the Kazakh boxer like a sack of spuds. He was dropped again a few moments later and this time the referee had seen enough. The doctor was in the ring at lightning speed but the local boxer was back on his feet a few seconds later. Medzhidov, being the class act that he is, assisted his opponent to his corner in a show of splendid sportsmanship. This was a sudden and shocking change of events that silenced the crowd, though Medzhidov's attitude towards his beaten opponent won him some applause nonetheless from the host nation's crowd.